From Walter: here are the two scanned documents from HIAS. 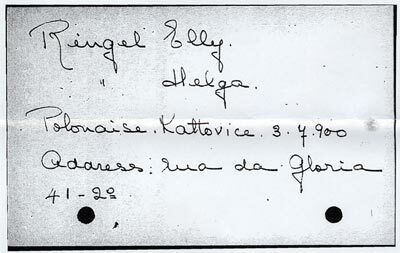 The first is the file filled out by the HIAS worker in NY and the lower is their address in Lisbon. I introduced you to Irwin Schiffres in the last post because his story of escape from southern France in the summer of 1940 courtesy of Dutch consuls closely tracks to my mother's similar story. When I listened to his oral history, collected by the Ellis Island Immigration Museum, I found many other parallels that help to illuminate Helga's experience. I'll summarize. Schiffres was raised in Cologne of a Polish-born dentist and his German wife from an orthodox Jewish family. They were somewhat insulated from the early anti-Jewish measures and even after the Nuremberg laws the family remained fairly comfortable. 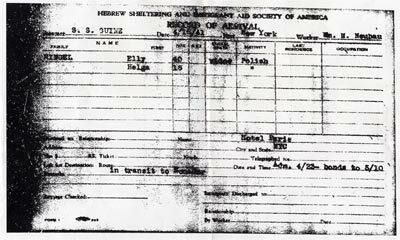 In 1938, Poland changed its laws to revoke citizenship to nationals living abroad, and Germany responded by issuing pre-emptive deportations to Polish Jews in Germany, including Schiffres' father. Irwin's father was able to travel to Belgium, where he had a brother. Similarly Irwin's mother was able to travel to Holland, where she had a brother. Thus the family split up for the next five weeks. Irwin remembers being strip-searched (looking for hidden money) as they crossed the border at Kaldenkirchen. Then they stayed for a month in Rotterdam before making the more difficult crossing from Holland to Belgium. There they had paid to be met by a smuggler who vouched for the Schiffres as family members. In Belgium, they reunited with Irwin's father in the resort town of Spa, surprisingly close to German border and just 60 miles from their departure point of Cologne. They lived in Spa for nine months, perhaps with hopes that they might be able to return home. By September, when war commenced on the Eastern front, they concluded it was time to move on. They next went to live with the uncle in Antwerp until May 10, 1940, when the war swept into Holland and Belgium and they joined the legions of refugees on the run. They were delayed crossing the French border at De Panne, because at first the father's Polish passport was not accepted. Then they were in Dunkirk, Calais and Paris, before proceeding with thousands of refugees to Bordeaux. They stayed there in a furnished room for a month, leaving on what Schiffres says was the last train out of Bordeaux to Hendaye before the Germans arrived on June 21. Schiffres doesn't mention Sousa Mendes in his account, and even though his family was in the right place to possibly obtain help from the Portuguese consul they evidently did not, either in Bordeaux or Hendaye. Unable to exit France, they were bused to a possible temporary shelter among French peasants but Schiffres' mother did not trust the offer and they continued on to Toulouse. Here they spent the night in a refugee center in a converted movie theater but decamped early the next morning, again on the distrust of the mother. In retrospect, we know that if they had hung around Toulouse for a few more days, they might have secured visas there. Instead, they departed by train for Marseilles, where the family would spend the follow two months, long enough for Irwin to be enrolled in a school there for eight days. It was there in the latter part of August where the family was able to secure a destination visa from the consulate of the Netherlands to travel to the Dutch East Indies. Not Curacao but Indonesia, but similar in many respects to the Dutch visas in Toulouse. With the Dutch stamp, the Schiffres family was now able to get transit visas from Portugal and Spain, though not a French exit visa. They ended hiking across the Spanish border to circumvent that final requirement. I'll pick up with more of the Schiffres story, and its parallels to the Ringel story, in the next post.